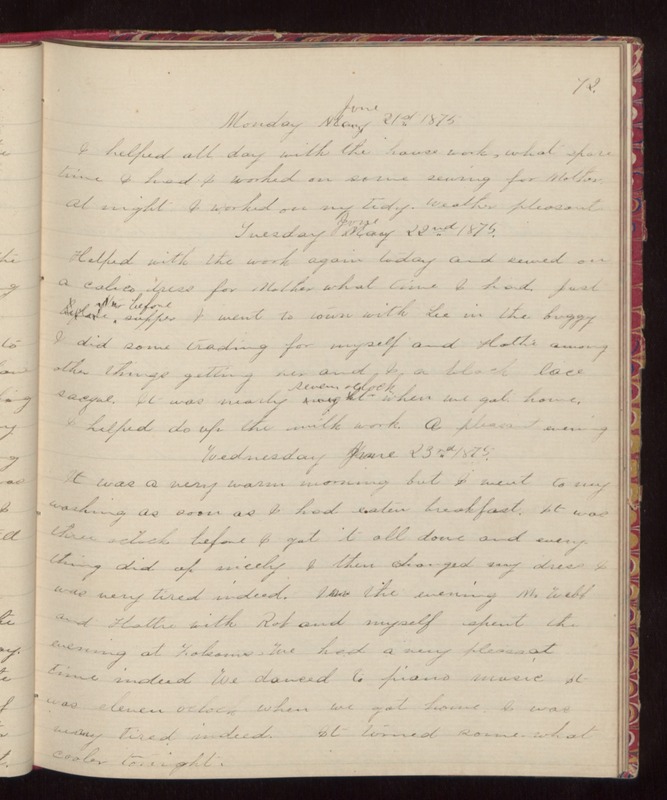 72 Monday June 21st 1875 I helped all day with the house work, what spare time I had I worked on some sewing for Mother at night. I worked on my tidy. Weather pleasant. Tuesday June 22nd 1875. Helped with the work again today and sewed on a calico dress for Mother what time I had. Just before supper I went to town with Lee in the buggy I did some trading for myself and Hattie among other things getting her and I a black lace sacque. It was nearly seven oclock when we got home. I helped do up the milk work. A pleasant evening. Wednesday June 23rd 1875. It was a very warm morning but I went to my washing as soon as I had eaten breakfast. It was three oclock before I got it all done and every thing did up nicely. I then changed my dress I was very tired indeed. In the evening Mr Webb and Hattie with Rob and myself spent the evening at Folsoms. We had a very pleasant time indeed. We danced to piano music It was eleven oclock when we got home. I was very tired indeed. It turned some-what cooler tonight.